ObiJan Technologies: More mile-high fun! 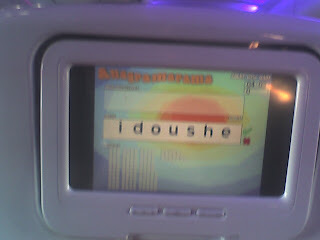 On a Virgin flight NY-SFO, I was trying out the various "Games" in the in-flight entertainment system. (I have a weird connection with those, more on that later). One of the options was sort of "wheel of fortune" setup, where given a string of 7 random letters, and you scored points depending which words you could create out of it. I was bummed to receive zero points for my 7 letter word, which not only should be in the dictionary, its also a great concept that I plan to license to Apple. Very funny! :) Good to know that your sense of humor still prevails, ObiJan Kenobi!